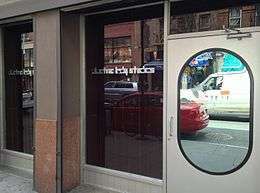 Electric Lady Studios is a recording studio located at 52 West Eighth Street in Greenwich Village, New York City. It was originally built by Jimi Hendrix and designed by John Storyk in 1970. Hendrix spent only four weeks recording in Electric Lady before his death, but it has since been used by many notable artists, see below List of Artists Recorded. Electric Lady Studio's current address has a long history. The basement housed The Village Barn nightclub from 1930 to 1967. Abstract expressionist artist Hans Hofmann began lecturing there in 1938, eventually retiring from teaching in 1958 to paint full-time. In 1968, Jimi Hendrix and his manager Michael Jeffery bought a newly defunct nightclub called The Generation located at 52 W 8th Street in New York’s Greenwich Village — a venue that Hendrix had frequented for impromptu performances and late-night jam sessions. The Generation had been known for live acts as diverse and legendary as Big Brother & the Holding Company, B.B. King, Chuck Berry, Dave Van Ronk, Sly & the Family Stone, and John Fahey. Instead of renaming the club and continuing with the live venue business model (Jimi’s original vision for the project), advisors Eddie Kramer and Jim Marron convinced Hendrix to convert the space into a professional recording studio, as studio fees for the lengthy Electric Ladyland sessions were astronomical, and Jimi was constantly in search of a recording environment that suited him. Architect and acoustician John Storyk designed each structural detail, and from there the origins of New York’s famed Electric Lady Studios were born. It would be the only artist-owned recording studio in existence at the time. Construction of the studio took nearly double the amount of time and money as planned: permits were delayed numerous times, the site flooded due to heavy rains during demolition, and sump pumps had to be installed (then soundproofed) after it was determined that the building sat on the tributary of an underground river, Minetta Creek. A six-figure loan from Warner Brothers was required to save the project. The studio was made specifically for Hendrix, with round windows and a machine capable of generating ambient lighting in myriad colors. It was designed to have a relaxing feel to encourage Jimi's creativity, but at the same time provide a professional recording atmosphere. Engineer Kramer upheld this by refusing to allow any drug use during session work. Artist Lance Jost painted the studio in a psychedelic space theme. Jimi Hendrix hired Marron to manage the construction project and run the studio. Hendrix spent only four weeks recording in Electric Lady, most of which took place while the final phases of construction were still ongoing. An opening party was held on August 26, 1970. The following day Hendrix created his last ever studio recording: a cool and tranquil instrumental known only as "Slow Blues". He then boarded an Air India flight for London to perform at the Isle of Wight Festival, and died less than three weeks later. ↑ Chris Potash, The Jimi Hendrix Companion: Three Decades of Commentary (New York: Schirmer Books, 1996), p. 94. ↑ "Lance Jost Designs Vintage Paintings". Retrieved 2007-04-09. ↑ Schillinger, Liesl. "Jimi Hendrix's Electric Lady Studios Turns 45." WSJ. Wsj.com, 12 Aug. 2015. Web. 18 Oct. 2016. 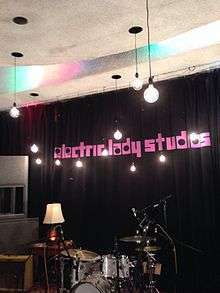 Wikimedia Commons has media related to Electric Lady Studios.